It&apos;s a misty morning in St. Charles. Bare treetops along the Missouri River poke out of the thick fog. It&apos;s easy to imagine Lewis and Clark&apos;s Corps of Discovery in 1804 pushing their boats into the river&apos;s channel en route to Fort Osage. 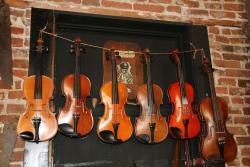 From a bargeman&apos;s fiddle to an opulent 19th-century showboat, river music is part of the American fabric. 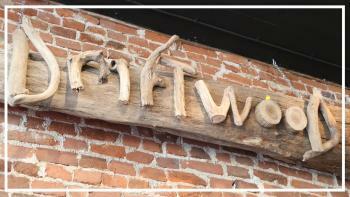 So it seems natural that a new store, Driftwood Music, would find its home in the historic Frenchtown district. 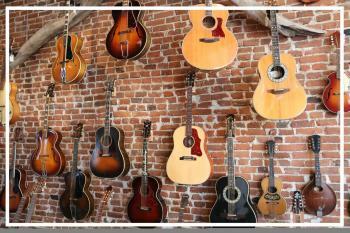 Housed in a 150-year-old building, Driftwood Music specializes in buying, selling, and repairing vintage stringed instruments, including fiddles, guitars, mandolins, banjos, and dulcimers. Lessons are also offered. 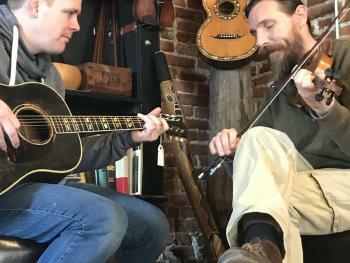 Store owners and musicians Colin Blair and Pete Buncher are already at work. As Pete tends to the customers who pop in for an appraisal or to inquire about an instrument, Colin talks about the shop&apos;s opening and its mission for music lovers. You&apos;re both musicians: how long have you been into music? Twenty years. I found my ability to play music and pick stuff up quickly before I knew the theory behind it. I knew instantly in my mid-teens this was my calling. I ran Music Folk in Webster Groves (in Missouri); that&apos;s how Pete and I met. We worked there together. How did the idea for a music store come about? Pete and I always joked that someday we&apos;d own a shop. Because of our specialties, we knew we could reach a lot of people. I play in two bands; the Root Diggers specializes in traditional music, and the Dust Covers is about pre-World War II blues. Pete&apos;s a rock star, his band To The Heights plays all over. Pete left town and went to Nashville and worked for Gibson Guitars, but we kept in touch over the years. We&apos;d always ask, when are we going to do this? About a year ago we were walking along the riverbank talking about where we would open the shop - we had been looking at a few properties in Frenchtown. The next question was, what will we call it? We were standing on top of a big pile of driftwood and Pete said, "How about Driftwood Music?" and I said, that&apos;s perfect. 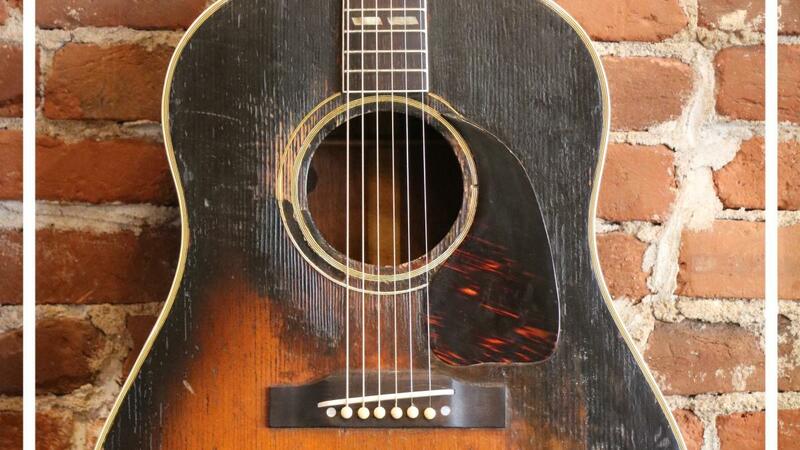 An instrument is kind of like a piece of driftwood, it goes through stuff, gets beat up. We knew the owner of the (property), so when it went up for sale, we jumped right on it. There&apos;s a whole lot of serendipity happening with this project. Once it started happening, this place almost built itself. We went down to the river and drug up some driftwood that looked like letter for our sign. We built a stage in a couple hours. Our concept was fully realized in a very short period of time. My wife owns the shop next door, Frenchtown Secret Garden, so we have this dream concept going on - husband and wife next door, each with their own dream. Art and music go together so well. Was the venue for live music always part of your concept? This area has a coffee shop and bars that offer music, but there&apos;s really not a listening room where music is totally the focus. There&apos;s a place in St. Louis called the Focal Point that I&apos;ve enjoyed for many years. Their concept is to bring in the best musicians from all over the world and give people a house concert feel. You can have a drink and hang out, but when the music starts, cell phones are off and it&apos;s full attention and respect for the music. That&apos;s important to Pete and I. Our first concert was a packed house. We can fit about 50 people in here, which is a very manageable size. Just enough for a good crowd, but small enough for everyone to meet one another. The acoustics in this room are wonderful, the lighting is just right. For our grand opening, we had 20 musicians throughout the day. Literally, for 11 hours straight, we had people packed in here, old-time music; it was a very elevated day. We&apos;re going to do two Saturday shows a month, local and national acts, so you can see really great performers in an intimate environment. 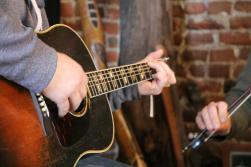 Weeknight jam sessions will offer traditional and Irish music. We&apos;ve gotten good reviews and there&apos;s a lot of buzz going on. We&apos;re going to keep that going. And the music, like the river, keeps flowing in St. Charles. Driftwood Music is located at 1106 N. Second St. For information on services and performances, call (314) 607- 3219 or visit Driftwood Music on Facebook. 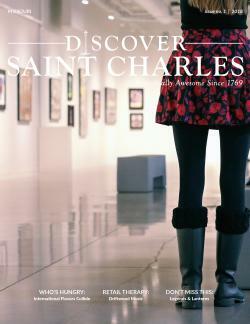 Discover Saint Charles Visitor Magazine.